Once upon a Friday, the view out of Chesapeake Bay Woman's back window, which faces Queens Creek, looked ominous but tranquil. With the threat of a Category 2 hurricane approaching, the Chesapeake Bay Family decided to take a nap board up in preparation, even though what CBW really wanted to do was run away to Bora Bora take a nap. So 46-year-old CBW and her 70-year-old father hauled plywood out of the basement, staggered up steps, teetered on ladders, banged heads against overhangs, struggled to see where screws needed to go, until, after much ado and more than a few foul words, they managed to seal up the sliding glass doors facing the creek. Do not adjust your dials. Pardon these blurry shots, but I took these from inside the house, through dirty rain stained windows and screens. As you can see, the tide was coming up into the yard, and white caps danced along the shore. This is the same view only through CBW's tears because her power had gone out and she knew she'd be without internet for days on end very rainy windows. The wind and rain were fierce; however, we're accustomed to storms, and this wasn't much worse than your average nor'easter or tropical storm. Of course that's just my uneducated opinion, and of course I didn't suffer major damage, so that's easy for me to say. There were deaths associated with this storm, although none were in Mathews. Every now and then, CBW would glance through the one sliding door that was not boarded up to make sure no trees had crashed down on her parents' house next door. Luckily none did, but you can see how even here, very early in the storm, Mother Nature was showing off her finest pruning skills on the pine trees. CB Parents' House. Clumps of pine needles all over the ground. It was almost as if nothing happened. This (below) was taken early in the day on Saturday from a window looking out towards the boat house and Miller's Cove. Here the tide is already over the dock. Later on, the tide came over the dock and seemed to swallow the boat house. You can't really see it here, but the tide is waaaay up and overtaking the boat house. Almost as if nothing happened. A very large pine branch came down onto the dock, nearly hitting the boat house. Locust branch down during the storm. And, I lost a major part of the locust tree. Locust tree the day after. Still, we fared very well, all things considering. There was no structural damage except minor issues with the dock which was dilapidated to begin with. I'll share more photos from the storm later this week, when I have more time and more patience. These took over an hour to load because both my laptop and my desktop are old enough to draw Social Security checks, and they've decided to act ornery up at the same time. In the mean time, I've received several inquiries from property owners (from as far away as Indonesia and France!) regarding the state of affairs here in the county. For the most part we fared far better than expected. If anyone reading has particular concerns, I am more than happy to travel to your property and take photos for you if you wish. Just e-mail me at ChesapeakeBayWoman@gmail.com. I enjoy hearing from you and am happy to help in any way. Thanks for your patience as I continue my lifelong struggle with technology and things breaking down on me. Hopefully we'll have more pictures later in the week, and if we don't that just means both the laptop and the PC are resting comfortably in the bottom of Queens Creek after a run-in with Hurricane CBW. 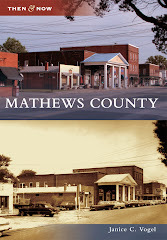 Mathews County survived Hurricane Irene! There was plenty of fierce winds and lots of rain, but overall we came out OK. The tide came up in the yard here, and trees and limbs came down, but otherwise there is not much to report other than the loss of power. And on that topic alone I could write a novel. Many people in the area are still without power. Some of us are thrilled to have running water! * power back but less than thrilled that internet service is still knocked out (depending on your provider). I fall into that latter category. So, I'll report back with all the highlights of the storm when internet is back to normal, which will probably be close to Halloween long after the storm is even worth mentioning. * What is worth mentioning now, since I had to explain it to my boss at work when he gave me the furrowed brow after hearing we couldn't take showers, is that most of Mathews is on septic systems and well water. In anticipation of losing power, we're always instructed to fill up our bathtubs so we have water for rinsing off or flushing toilets, for example. Two or more days of this is enough to make you want to run screaming off into the night a test of one's character, at best. Two or more days of this plus no internet? Is insanity. I'll be back on whenever my internet is back up and running properly. Here are a few random shots from the public landing at Onemo. These photos have nothing to do with the hurricane which is headed our way. This is how I cope with disasters. I casually mention them before taking an evacuation route to a state called Denial, where I ramble incessantly about anything else, such as bushel baskets on a dock. Before I return to Denial, let me say that I'll post an update on the storm known as Irene as soon as possible after the worst is over, provided we have current (which is the Mathews word for power or electricity). That update will have nothing to do with bushel baskets--unless that's what I'm using to pick up my personal belongings which have been strewn from here to Richmond. p.s. Here's hoping that everyone in the storm's path stays safe and that bushel baskets will be completely unnecessary. p.s.s. Click here for step-by-step instructions on how CBW prepared for a previous storm and photographic evidence that we'll probably be underwater here this weekend. Welcome to Three Thing Thursday, where we're encouraged to share three (or more) random (or related) thoughts. Whatever happens to be on your mind. I'll begin, but only because I must. 1. These photos were taken from our campsite over on the Eastern Shore last weekend. It is funny how I traveled over 100 miles to sleep in a tent with 4 teenagers only to enjoy the exact same sights very similar to what we have right here in Mathews. But there's something nice about running away being far from home even if you are sleeping in a tent full of kids on what feels like a slab of concrete in the middle of a raging storm. 1b. I promise that's the last time I'm going to talk about that camping trip. However, I am starting to think I'm suffering from post-traumatic stress disorder. 2. The hurricane is supposed to hit this weekend. 2c. Is it me or has the wind already picked up significantly? Or is it still blowing from Tuesday's earthquake last weekend's Middle of the Night Storm? (Oops!) Is it possible that a hurricane so far away can create such steady wind, or is this related to something else, such as post-traumatic stress disorder? 3. It's been really cool the past several nights. I don't mean cool as in kool. I mean cool as in brisk, chilly. What a treat it's been to sleep with the sliding glass doors open. The Insect Serenade each night is fine as long as they stay outside very relaxing after a long day of earthquakes, commutes to work, and the details of every day life that include transporting children to and from various school-related activities even though school has not yet begun. That's all I have for the time being. Now it's your turn. Please tell me three (or more) random (or related) things going on in your life right now. These were taken about a week ago at Aaron's Beach. Back in the days before major events like earthquakes. 2011 has been a very interesting year thus far. First, we had a tornado. Yesterday as I was daydreaming about Bora Bora very hard at work, an earthquake shook my office building so hard we were swaying. A text from Baby Sister last night stated, "Mamma said the chandelier was swinging and the mirror was shaking but Daddy didn't feel it because he was cutting grass." Middle Sister's Facebook post reported, "Just talked to Mamma and Daddy....Daddy was on the lawn mower and said he didn't know if there was any earthquake in Mathews. Mamma said the house shook, the chandelier spun around for 30 seconds, the sofa was jumping off of the ground. Always two different perspectives about the same event. LOL! Baby Sister posted the following status on Facebook: "Well, I WAS going to go jogging but I think I will have some wine instead." Last but not least, Chesapeake Bay Mother posted the following: "Gustav didn't even honk." Now a hurricane is potentially headed this way! Who said life in Mathews is boring? Chesapeake Bay Woman put your hand down. Last weekend, the Chesapeake Bay Children, their friends and I went camping over on the Eastern Shore in Cheriton, which is almost directly across the Chesapeake Bay from Mathews. Actually, the town of Eastville is directly across the bay from Mathews, and many moons ago folks from Eastville settled in Mathews and called the town Westville. Who here besides Chesapeake Bay Woman is wondering how a story about her weekend camping trip has already gone so far off course? Anyway, Cherrystone Campground in Cheriton on the Eastern Shore is on the Chesapeake Bay, almost directly across from Mathews. The shot above was taken from our campsite. It was lovely, really. But see all that sand? That wasn't so lovely sprinkled all over the tent floor and was not nearly as comfortable to sleep on as you might think, unless you're thinking that it would feel like concrete and then you'd be correct! CBW, always with an astute eye for detail, did not bring anything that would aid in the removal of said sand, because she was only focused on those bare essentials that would fit (along with 4 teens, a tent and their belongings) in the back of her car. Oh, and on the topic of essentials? Evidently CBW considers sleeping bags and blankets to be nonessential. Or rather she brought some but not enough. CBW realized this when she awoke Saturday morning (with sand ground into her face, thank you very much) and noticed that Chesapeake Bay Daughter's friend was wrapped up in a beach towel. This, of course, brought back her own fond memories of sleeping wrapped snugly in a vinyl tablecloth on her 1977 cross country camping adventure with her own dear family. On Saturday, the day after The Storm which I'll discuss in a minute, the children went kayaking. Here they're headed for that delightful spot of pristine beach--the very same stretch of beach which has two large, imposing, intimidating No Trespassing signs. Below is the tent. This is the same tent that almost blew away Friday night in The Storm. Everything looks so calm and serene here, doesn't it? Belows is what the sky looked like Friday evening. In spite of the ominous looking clouds, CBW cheerfully made a campfire and sat down to relax as she watched lightning flash far off in the distance. As far as she could tell the storm was headed north and was hugging the eastern side of the bay. At about 1:30 a.m. she awoke to the sound of an oncoming train howling winds and a screeching daughter, who was hovering over her trying to explain that the rain cover had come loose from the back side of the tent. CBW ran bleary eyed outside to grab the rain cover and hold it down. Only problem was she could not let go of it in order to locate the hammer and stakes to secure it. So there she stood, being pelted by rain and barely able to open her eyes due to the oncoming wind. Just about this time, as she's standing in the dark in the middle of a storm, her camping neighbor came over and hollered that her campfire (which she swore was out before she fell asleep) was raging out of control. Then he hollered for his wife to help with the rain cover. He tended to the out of control campfire, and the wife held down the rain cover while CBW went groping around in the dark, windy night looking for her ruby slippers so she could wish herself back home hammer. It takes a village to salvage a CBW camping trip. CBW (who amazes herself by using the third person when discussing traumatic events) staked down the rain cover, thanked the neighbors profusely and raced back inside where she and Daughter and Daughter's Friend held down the front of the tent with the weight of their pools of tears bodies. Meanwhile, the teenaged boys never opened an eye. But they successfully held down their corner of the tent. Teenagers. The wind raged and the storm howled and CBW cried finally things started to ease up a bit. Then, after what felt like five minutes of sleep on sand as hard as concrete, the sea gulls started squawking and campers emerged from their travel trailers all rested as if nothing happened. In fact, the next day it appeared as if nothing had happened. Unless you count nearly being blown away and almost catching the campground on fire nothing. This concludes the nightmare highlights of our weekend on the Eastern Shore. If serendipity is making fortunate discoveries quite by accident, then herondipity is the good luck associated with having the camera handy as a heron is taking off in flight, even if the person taking the photograph is not good at action shots and even if it's very difficult to tell in that last photo what exactly is going on. Speaking of serendipity, there was precious little some of that involved in Chesapeake Bay Woman's weekend camping trip over on the Eastern Shore, but not enough to outweigh her normal vacation luck, which summarized succinctly is as follows: Murphy's Law. Once upon a time, Chesapeake Bay Woman completely forgot she was 46 years old and decided to take two teenagers and two almost teens on a weekend camping trip over on the other side of the Chesapeake Bay. For those who struggle with numbers and word problems, as Chesapeake Bay Woman does, that's one absolutely insane 46-year-old female and 4 children, 2 of whom are not her own. 1 tent. 2 hours away from home on the other side of the Chesapeake Bay where the weather forecast every single day in August is "There's a 100% very good, if not excellent, chance of a spontaneous thunderstorm, and that already excellent chance goes up exponentially if CBW is camping in a tent over here, y'all." She also forgot what it was like setting up a tent in Amazon Jungle humidity, just as she forgot how uncomfortable sleeping on the ground is at her age. And she also forgot how much she dislikes taking a shower in flip flops* with 100 of her closest camping neighbors, all of whom were from the state of New Jersey, a state that evidently encourages people to talk very, very, very, very loudly. No matter where they are and no matter who else is around. Whatever is on their mind is also on yours. Hi, Maria from NJ! Since I have decided you must win the 2011 Blog Cabin, I automatically consider you a Virginia resident already, so please don't be offended at my blanket remarks about your lovely Garden State and its many citizens, all most of whom were on vacation with me this weekend. They're very nice and mean well, I'm sure. But evidently they can't hear very well because they're always shouting even in casual conversations. Don't forget the Vietnamese spring rolls. Thanks! The serendipitous part of the camping weekend, which was the actual camp site and its spectacular view of the Chesapeake Bay, will be shared tomorrow after I've had time to consult a therapist load the photos. The un-serendipitous part, also known as The Storm, will be shared tomorrow too. No photos are available for that Middle of the Nightmare Event other than the flashbacks I'll be experiencing for the rest of my life. To read about CBW's family history of camping fiascos, please click here or here or here. * CBW brought only one pair of shoes on her camping trip: flip flops. These same shoes broke before she took her first communal shower (flip flops are essential for communal showers, by the way). For the remainder of the trip she was forced to wear her daughter's purple Converse low tops. By this point in the trip, which was the same day she woke up after two precious hours of sleep with sand on her face after the previous night's gale-force winds caused her to almost catch the campground on fire, she just. Didn't. Care. These were taken last week from Aaron's Beach. This weekend, the Chesapeake Bay Children, their friends and I will be squeezing the last bit of life from summer. If we survive--the good Lord willing and the creek don't rise--I'll report back Monday with highlights from our adventures that will involve teenagers, a tent, communal showers, and gale force winds and a thunderstorm or two since CBW the tent is involved. to you courtesy of Aaron's Beach and a very challenging week. This cute red structure sits on the side of the road on the way to Haven Beach. It so happens it's also on the way to Aaron's Beach, which is where I was headed this particular morning to go jogging. Mind you, I had no intention of jogging on the beach. Rather, I wanted to park at the beach and take advantage of the flat, traffic-free road leading from there to this barn. And back. Mathews has countless miles of great roads for walking, jogging and biking. Most of the county is twenty thousand leagues under the sea at or below sea level, so there are very few hills to worry about, septic systems notwithstanding. And, as I was saying, there are very few cars, unless you're on 198 or 14, and then you can pretty much expect to get mowed over. But I'm not talking about 198 or 14 except I just was. I'm talking about this remote section of Nowhere near the public beaches. Wanting to know how far this red building was from the parking lot at Aaron's Beach, I pushed in the odometer button and was very pleased to see that it came to about 1.5 miles one way. Give or take. Which was good since I wanted to run 3 miles. Give or take. So I parked the car at Aaron's Beach, started running towards this barn, and ended up being chased and attacked by biting winged monkeys flies the entire way, making me wonder why I ever EVER think I can go jogging near any of our beaches and their associated swamps loaded with mutant insects marshes even though here in these pictures the beach and its associated marshes are 1.5 miles away. Give or take. p.s. I almost swallowed one--a biting fly, that is. The whole nightmare reminds me of a saying I learned in 9th grade Spanish many years ago: "En boca cerrada no entran moscas," which means flies don't enter a closed mouth. Unless, of course, you're jogging down a swamp in Mathews County, in which case Good Luck! because the insects are going to win no matter what you do or how tightly you clench your jaws shut. The other morning right after hearing one of my least favorite sounds--the alarm clock going off at five thirty--I heard one of my favorite sounds. No, it wasn't a red-winged blackbird. Nor was it a whip-poor-will, which is a sound I've loved since the summers of my youth. It wasn't the sound of the door slamming behind me on my way out of the office, either, although that, too, is one of my all-time favorites. No, this was a rare morning when my neighbor started up his work boat that he keeps in the cove down the way from me. And he went out for a spin. It was a beautiful morning for a spin. He didn't go much farther than this before he put her in reverse and went back towards the dock. Although I really don't care much for getting up so early, sights like these make having to do so just a little more palatable. But now that sunrise isn't occurring until later and I am waking up in the dark, never mind. These were taken at the public landing in Onemo. If a picture paints a thousand words, and there are five pictures here, that's five thousand words, only slightly less than what I usually write in a given day yet never seem to get to the point more than enough words for one blog post. Of course I still call a refrigerator an ice box and eat supper rather than dinner because dinner is really lunch, at least according to my favorite grandmother. So don't pay any mind to what I happen to call things. It's either way outdated, blatantly wrong, or close but no cigar. In this particular case as it relates to the public landing, I just call all of them The Public Landing. It so happens, however, that our tourist literature assigns fancier names, which I pass along for my own education for everyone's benefit. And now, before I get too far off track, I'll bring this post to a merciful close by wishing you a very happy weekend. *According to what I'm reading, which is a handy dandy guide to Mathews County given out at the Information Center, there is Winter Harbor Haven located in Peary at Horn Harbor. And there is Winter Haven Landing located in Onemo at Winter Harbor. There are far too many harbors, havens and winters being referenced for any of this to be meaningful, which is why I must insist on calling it simply the public landing at Onemo. Thank you for your patience as I struggle with attempt to navigate these very confusing waters and their associated proper names.